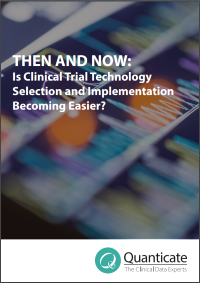 Then and Now: Is Clinical Trial Technology Selection and Implementation Becoming Easier? Go Big or Go Home – The era of a CRO implementing a technology on a “study-by study” basis is over, owing to the accepted advantages of a truly strategic partnership. It Takes a Village – Developing a strategic relationship between a CRO and a technology provider involves a range of stakeholders from many functions. Plays Well with Others – Implementing multiple technologies should be synergistic, but this is only possible if those technologies may be integrated. This article will examine the planning, communication and support required for successful clinical trial technology selection in the current state of the industry compared to previous years. The article will also outline keys to success for a mutually beneficial CRO and technology provider relationship. To receive a copy, please fill out the form.